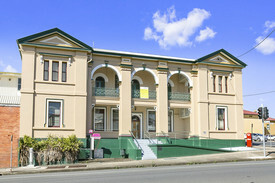 10 Commercial Real Estate & Properties in Gympie are listed in 4 categories. We have 5 OfficesSale & Lease , 2 Development LandsSale & Lease , 2 Industrial Warehouses Sale & Lease and 1 Retail ShopsSale & Lease . A Mixed Use Development From $60,720 + GST (if ap.. Under Instructions from Cameron Crichton and Shaun McKinnon. bull; Price Guide $800,000 + GST bull; Development approval for 142 townhouses and nine lots bull; Zoned Residential Living bull; Land subdivision opportunity bull; Elevated site adjoining established residential estate bull; 4.42 hectares Offers to Purchase Closing Tuesday 30 August 2016 4pm Andrew Burke 0417 606 128 Tony Williams 0411 822 544 approximately This property is being sold without a price and therefore a price guide cannot be provided. The website may have filtered the property into a price bracket for website functionality purposes.